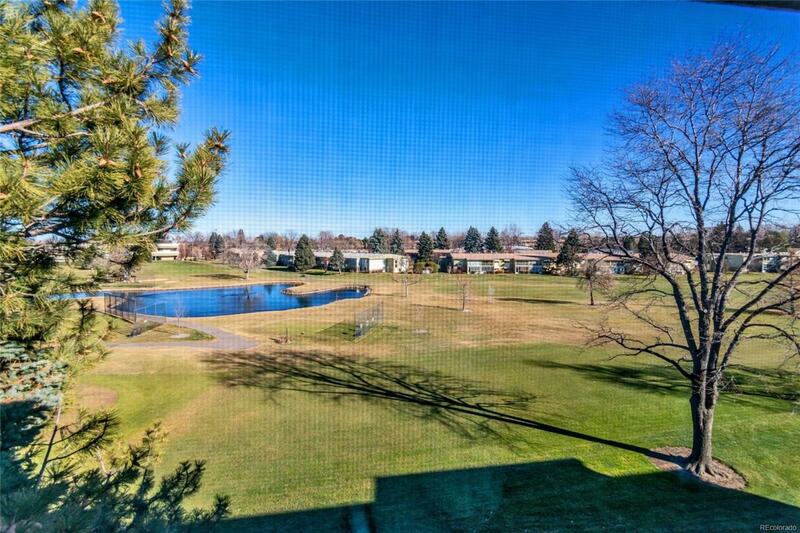 Great opportunity- penthouse 1 bedroom, 1 bathroom, with detached garage, overlooking the golf course! Lake with fountain in view! Updates throughout- Kitchen features white cabinets, all white appliances stay, & updated countertop. Bathroom features tile floor, updated vanity & fixtures. Oversized bedroom with 2 closets. Laminate flooring throughout kitchen, living room area, and bedroom. Bonus storage room on same floor. Enclosed glass/screened in lanai. Denvers largest active adult living community, age 55+. FHA/VA approved community. Taxes are included in HOA monthly dues! And also includes heat, water, 24-hour patrolling community responder, club house w/indoor & outdoor pool, hot tub, sauna, 9 hole par 3 golf course, activities, restaurant, & more!